This healthy, Asian-style soup is ready in only 45 minutes. Ingredients such as rice vinegar, fresh ginger, sesame oil, and soy sauce add tangy and savory flavors. In a large nonstick skillet heat canola oil over medium heat. Add green onions; cook and stir about 2 minutes or until tender. Add half of the garlic and the ginger; cook and stir for 30 seconds more. Remove from heat. In a large bowl combine green onion mixture, egg whites, panko, sweet pepper, 1 tablespoon of the soy sauce, and 1 teaspoon of the sesame oil. Add ground chicken; mix well. 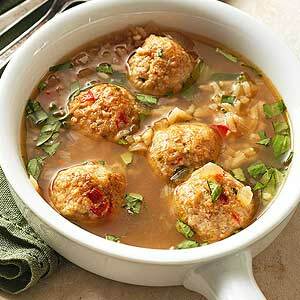 Shape chicken mixture into 1-inch meatballs. In the same skillet cook meatballs over medium-high heat until brown, turning occasionally. Set aside. In a large saucepan heat the remaining 1 teaspoon sesame oil over medium-high heat. Add yellow onion; cook for 2 to 3 minutes or until nearly tender, stirring occasionally. Add the remaining garlic; cook and stir for 30 seconds. Add the remaining 2 tablespoons soy sauce, broth, the water, vinegar, honey, and crushed red pepper. Bring to boiling; stir in meatballs. Return to boiling; reduce heat. Simmer, uncovered, until meatballs are cooked through (165 degrees F). Stir in cooked rice and basil.